SOUTHFIELD, Mich., July 12, 2018 /PRNewswire/ -- Federal-Mogul Powertrain has launched its next generation textile sleeving for crash protection and impact resistance. Available for heavy-duty and light vehicle applications, CrushShield® 2448 features a new heat shrinkable design that absorbs and disperses energy during a crash, protecting sensitive vehicle components including air conditioning lines, fuel lines, hoses and high-voltage cables. The product also provides superior abrasion resistance, which prevents mechanical wear from nearby components that come into contact with each other. Federal-Mogul Powertrain will exhibit the new CrushShield 2448 sleeving, alongside many of its other products at the 2018 IAA Commercial Vehicles in Hanover (Booth C30/Hall 13, 19-27 September). "As heavy-duty engines continue to increase in complexity, so does the amount of tubing, hoses, cables and wiring components required to maintain effective vehicle operations," said Gian Maria Olivetti, Chief Technology Officer, Federal-Mogul Powertrain. "As a global leader in the design of abrasion and crash technologies as well as innovative textiles, our Systems Protection CrushShield solutions have been proven in advanced testing to provide impact resistant, durable protection for components." CrushShield 2448 utilizes a high performance, multi-layer textile design that enables it to dissipate energy in a crash situation, while also providing excellent abrasion protection. Its innovative design has a shrink ratio up to 4:1 with a minimum shrink temperature of +140°C, enabling simple installation over large connectors, brackets and contours with sharp angles, delivering protection where it's most needed on the application. 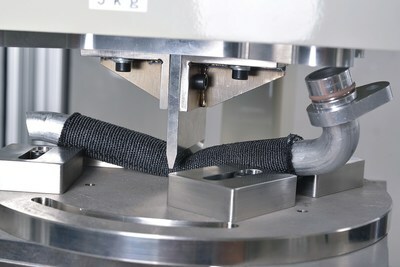 The heat shrinking design also enables the sleeve to increase in density and toughness when fitted or "shrunk" around the component, maintaining its shape in extreme environments and preventing exposure of the protected products, further enhancing impact and abrasion resistance while increasing component durability. "Ease of installation is truly the hallmark of CrushShield 2448's design," said Tammy Ebersole, Vice President and General Manager, Systems Protection, Federal-Mogul Powertrain. "When installed, this product will firmly grip onto the protected component, eliminating the need for additional fixation devices, reducing overall installation time and complexity for the customer." To better serve its customers throughout the world, Federal-Mogul engineers have developed specialized equipment and a proprietary test method to evaluate the impact resistance of protective sleeving over various components such as cables and tubing. The test is highly customizable and can be varied or adjusted to replicate failure modes often seen in actual crash environments. Designed as a comparison test, it effectively demonstrates differences in a component that is unprotected and protected after an impact event. Crash tests performed using CrushShield 2448 resulted in an increase in crash protection by more than 70-100 percent, depending on the application. The sleeve was tested using LV312-3 specifications and is classified as class E( >50J) on shielded cable and Class F (>75J) for unshielded cable. When tested for abrasion according to LV312-3 specifications, CrushShield far exceeded the highest abrasion category G (≥ 30,000 cycles).